COVER: Basic concept and rules of the game. Choosing the best opening moves. The running game. Blocking. The back game. And tips to help you win. All explained step-by-step. Clear, easy-to-understand instructions. Picture a cozy fire with a board set up between two old friends ... a backgammon game is in progress! Two college roommates are enjoying an hour of relaxation between classes. That board they're concentrating on could only be ... backgammon! 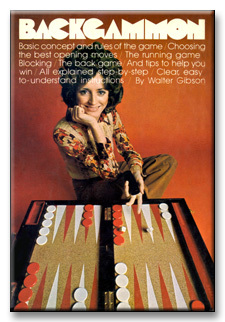 Backgammon ... a game that had its origins in England as early as the 10th Century. Backgammon ... a game played on a board, with pieces moved by the throw of the dice. And ... you will see these plays come to life by studying the numerous diagrams that carefully explain each step of the text. Written in a clear, concise style, this book will hold a special place on the "game shelf" of every home library.